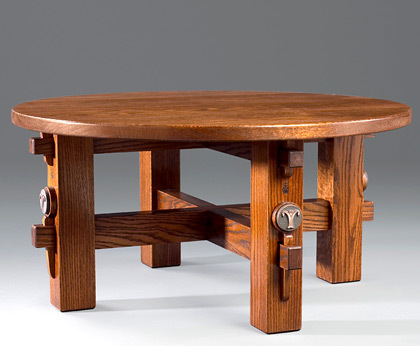 Barry R.Yavener - Roycroft Master Artisan – Fine Handcrafted Wood Furniture in the Roycroft tradition of simplicity, expert craftsmanship and good design. 39” diameter x 19” tall. This table breaks down by removing the top and then the keys. All pieces are marked to make set up very easy. Available in the wood of your choice.